Loads had changed in the travel acoustic market since our last refresh, so we decided to give our chart a revamp to reflect this. We removed some models, such as the Cordoba Mini O and Washburn Rover, and replaced them with five new models. This included the highly-impressive AG-105EQ from Traveler Guitar, as well as the new Cordoba Mini II MH and Fender CT-60S. We added an old favorite in the Taylor Baby Taylor BT2, as well as a budget-friendly option, the Rondo Music SX Trav 1. What Should the Best Travel Guitar Have? Traveling the world? Good for you! But if you’re a true guitarist, you aren’t going to want to hop from country to country without a trusty axe by your side. But please… make your life easier – leave your $5,000 solid-wood Martin at home, and pick up a dedicated travel guitar instead. As you’re about to see, there’s no one-size-fits-all travel guitar. You could use a smaller version of a full-size guitar, such as a parlor or a 3/4 size; you could use a full-size guitar where the neck folds in half (yes, they do exist! ); or you could use a travel-dedicated guitar which, truth be told, don’t really look like guitars in the first place! Whether you’re off on a six-month global voyage, or just heading to a different state for the weekend, check out the following chart of travel acoustics, which will give you a good idea of what’s worth taking with you on your next trip. Yamaha’s silent travel guitar offers the full acoustic experience. An innovative mini acoustic with full-size playing experience. Great travel sized guitar with a sound that is hard to beat. A fun-to-play mini acoustic with a big voice. Portable, robust and light – a wise choice for guitarists on the move. A compact and affordable Fender that’s perfect for travel. Small name, small guitar, but big value! A new travel-friendly classical guitar from Cordoba. Featuring a highly distinctive and compact oar-shaped body. A small scale Yamaha with a big voice. First, let’s discuss some of the things you need to consider. Keep an eye on your budget. Any guitar that you take out of your house is going to be subject to damage or loss. How much can you afford to lose, or how much are you willing to pay to replace it? A cheap guitar is not necessarily the answer, but it is an option. Next, the size of the guitar will matter how much space it will take up, but it also effects playability and the sound it produces. A parlor style instrument has a certain sound and vibe that may not be to your liking. It might tick the boxes of the right price point and the right size, but you have to make a connection to the instrument. It doesn’t matter if it travels well, if you don’t like the guitar you won’t be playing it. The guitars we have listed will answer some of these needs, but none of them answer them all. We hope to help you narrow your choices down to get the best travel guitar for you. We have links to our more in depth reviews to let you have the best information to make an educated decision. The Yamaha SLG200S has a unique twist – it’s silent! One of the more expensive models in our chart, this steel-string electro-acoustic is made with a detachable maple and rosewood frame with a solid mahogany body that extends from the satin-finished mahogany neck. The guitar feels very light but comfortable to play, with a generous single cutaway allowing good access to the 22 frets that sit on the rosewood fretboard. As we highlight in our full review of the Yamaha SLG200S, it’s voiced by an SRT Powered preamp system with an undersaddle pickup, and features versatile controls including a built-in effects rotary control, with reverb and chorus. Sounds great through an acoustic amp or – with the built in headphone socket – played quietly to yourself. 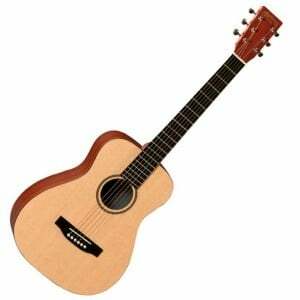 From the innovative Californian brand Traveler Guitar, comes the AG-105EQ – an impressive small-bodied acoustic guitar that’s designed specifically for travel. Yet, despite the reduced airline-friendly size, it still offers a full-size (25.5” scale length) playing experience, with normal string spacing. In the full review of the AG-105EQ we look at the size and materials in more detail, yet the combo of solid spruce and mahogany make for a quality tone, which is louder than expected. The featured hardware is very commendable, with good Shadow electronics and a versatile preamp. It also comes with a quality custom-fit padded gig bag, making this guitar easy to grab and go, wherever your playing may take you. This is one of the best travel guitars that you can find on the market today. The difference between this one and the LKX2 are the tonewoods that were used for crafting them. The Martin LXM comes with a spruce top and mahogany side (all laminated, of course). The LXM also uses the same forest friendly materials that are the trademark of Martins in this price range. Coming from the iconic American acoustic brand Taylor, the BT2 is one of a collection of Baby Taylors, aimed at smaller players and guitarists on the road. The reason being it is cute and compact but doesn’t compromise on sound or functionality. The design and build of the BT2 is very impressive for the relatively affordable price. 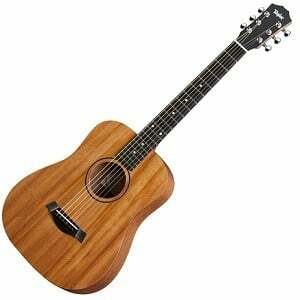 It features a solid mahogany top and laminated sapele back and sides, with a mahogany neck that retains the typical playability of a full-size Taylor. The tone and projection are surprisingly great for such a small guitar, which is helped by the slightly arched back. Be sure to read more on the BT2 in the full review. 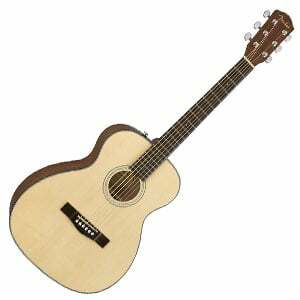 Another Traveler Guitar model on our list, the Ultra-Light electro-acoustic is a little more affordable than the AG-200EQ. With three color choices and a full-size scale length of 24.75”, the body and neck are made from a single piece of solid Eastern American hard maple, with a smooth satin-finish. The neck includes an ebonized rosewood fretboard and 22 medium frets. At only 28” long and around 2lbs in weight, this acoustic is incredibly light and portable. With a detachable lap frame it’s also very comfortable to play with. Other hardware includes good quality chrome tuners, a gig bag, and a piezo pickup which offers the guitar a voice. Check out our full review of the Traveler Guitar Ultra-Light for all the details. 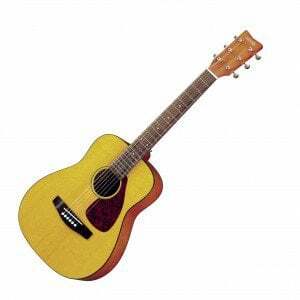 The CT-60S is Fender’s offering to the small guitar market, and makes for an excellent travel acoustic. Part of the brand’s affordable Classic Design Series, the CT-60S features an Auditorium body shape with a reduced 23.5” scale length. It’s made from quality tonewoods including solid spruce on the top and laminated mahogany for the rest of the body, which results in a rich tone and good projection for the compact size. It also shows off some upgraded features that make it instantly more playable, such as the slim neck profile and hand-rolled fretboard for excellent comfort. Want more? You can read our full review of the Fender CT-60S here. While Rondo is no big name compared to some of the others on this list, the SX Trav 1 is an affordable travel acoustic that has plenty of worth. First impressions are great, as the materials, fit and finish all stand up to scrutiny. The top is made from solid spruce, complemented by a laminated mahogany back and sides. The mahogany neck features a 20-fret rosewood fretboard and is very playable. This all combines for a small guitar that – while compact in size – offers a grown-up tone on the road. Throw in some reliable hardware and a padded gig bag, and there is plenty of value in this little beauty. There’s more on the SX Trav 1 in the full review. In late 2018, Cordoba released the Mini II Series to replace the popular original Mini collection. Growing in popularity, the MH is the all-mahogany part of this series, offering a nylon-stringed travel guitar which actually sounds like a guitar, not a ukulele! This is largely down to the deeper body (around 3”), although the 22.8” scale length ensures it remains very portable indeed. The MH is made from laminated mahogany, with a mahogany neck and a 19-fret composite fretboard. Playability is good and – aside from the lack of a gig bag – this feels like a steal at under $200. The full review of the Cordoba Mini II MH offers more details on this cool classical guitar. 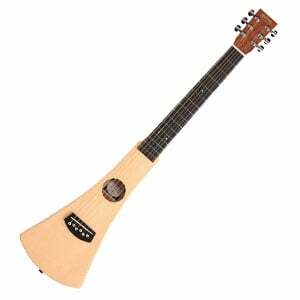 Featuring a highly distinctive oar-shaped body, the Martin Backpacker travel guitar was made to be ergonomic, convenient, and easy to hit the open road with. The Backpacker comes from the legendary builders at Martin who have been building amazing instruments for over a hundred years. The Backpacker sacrifices tone so that it can be more portable. Think of the Backpacker as a traveling fretboard to keep your fingers limber while you are away from home. There are only fifteen frets on the select hardwood neck with a scale length of 24”. Martin’s building techniques and alternate materials are used to make a more forest friendly instrument. 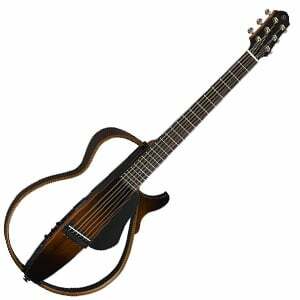 It also comes available in a nylon string version. This travel sized masterpiece by Yamaha has a loud and clear voice. It is modeled after the company’s very successful FG series, but in a smaller package. The Yamaha JR1 is a shorter scale length folk guitar. This is a well built and durable instrument that can withstand the trials of the miles. It has a spruce top with meranti back and sides. The neck is made of nato, which has similar tonal characteristics to mahogany. The fingerboard and bridge are both made of rosewood. It is a great beginner’s instrument with its smaller size and solid construction. If you want a travel companion you could do much worse than the JR1. 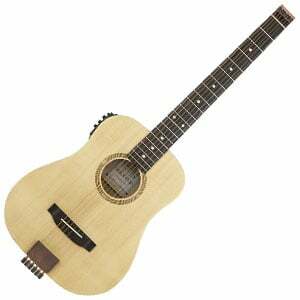 A travel guitar could technically be a full-size Jumbo model, providing you are happy to take a huge guitar like that on the road, train or plane. However, when most people discuss travel guitars, they are talking about those that are specifically designed for quick and easy transportation. 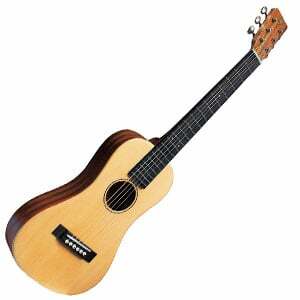 As some of the models on our chart will have shown, travel guitars come in all shapes and sizes. They could be as simple as a 3/4 or 1/2-sized guitar, which retains a full (albeit smaller) real wood tone. Travel guitars could be a full-size guitar that fold at the neck, offering full-size playability and tone but with the convenience of being able to fold the guitar in half! Or they could look like the Traveler collection, which are a little alien in design, but ultra-convenient to take along on your travels. There are a few key factors that you should consider when comparing different brands and models of travel guitar. Above all, you want something with a compact size. Travelling with a full-size dreadnought is all well and good for tone, but try maneuvering it along an airplane aisle or through a crowded train and you will soon be longing for something smaller. Of course, you will also want something that looks good and is built with quality materials, although you don’t want something that is so precious you feel scared to take it on the road with you. Thankfully most travel-dedicated guitars are robust in their build, capable of taking a few bumps. Talking about materials, solid wood isn’t so important when it comes to travel guitars as solid wood is not as resistant to temperature and climate changes as a laminate. If you still want the tonal benefits of solid wood, choose something with solid wood on the top but laminated back and sides. As for tone and projection, the smaller you go, the quieter the guitar tends to be. It will depend on whether you are travelling with a guitar for practice or performance. If you are looking for something to impress with on a street corner or in a coffee house, a full-size guitar that folds – or a small acoustic with a pickup and preamp system – is vital. If you are just wanting something with which to strum on the beach or noodle with in your hotel room, you can be more flexible. In that case, choosing a small guitar or silent guitar is a smart choice. Finally, consider the price. You don’t want to spend too much on a guitar that is more susceptible to being lost, stolen or damaged. Unless you are a professional musician or a gigging artist, travelling with an expensive guitar is silly when travel guitars exist at around $100 to $400. If something bad happened to it (God forbid! ), it wouldn’t be the end of the world. There we have it – a selection of ten excellent travel models ranging in sizes, styles and price categories. We hope this article has given you a little inspiration, whether you are buying or just browsing. A full-size folding guitar is very different in terms of tone and playability compared to a Baby Taylor, which is as different from an ultra-portable Traveler Guitar Ultra-Light. So be sure to try as many models as you can and figure out what works best for you. Good luck with your new axe on the road! So, what do the authors consider to be the ‘best bang for your buck’ travel guitar from this list? All of the listed guitars are great choice and are great bang for your buck. Pick what you like and that suits your budget and you can hardly go wrong with your choice! My neighbor has a travel guitar that he can take apart and fold up. Can you tell me anything about it? I recently purchased a Journey Instruments guitar. It is phenomenal sounding, playing and looking. Neck comes off and it fits in a roller backpack sized for carry on luggage! It is a great guitar and a brilliantly executed concept! Do yourself a favor. Check them out.